200-300 black youths rioted in the Delmar Look on Saturday night. The area is a popular bar and restaurant district in University City near Washington University. Two people were injured when the teens started firing guns. Blueberry Hill owner Joe Edwards said the first incident was highly reminiscent of similar events last year that led to increased patrols by four area police departments. There were two disturbances, including a shooting, in the Delmar Loop on Saturday night. 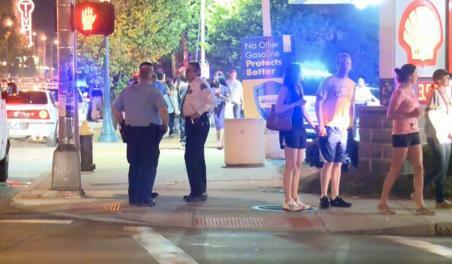 First, around 8:38 p.m., police responded to the area of Skinker and Delmar boulevards, where a crowd of about 200 to 300 youths had congregated, according to St. Louis police. Police tried to break up the group, which then moved toward Enright Avenue and gathered in the 700 block of Skinker. Fights broke out, and one person fired shots into the air, police said. It took about 40 minutes to clear the area, police said. No injuries were reported. Then, a little after 11 p.m., shots were fired in the parking lot of Church’s Chicken at 6190 Delmar. A 19-year-old man was shot under his left armpit, and a 17-year-old boy was shot in his abdomen. Both victims were listed in stable condition, police said. The victims told police they entered the Church’s Chicken parking lot to cut through to Delmar from Skinker. As they were exiting the parking lot, they heard several shots and realized they had been shot. The victims were taken immediately to a hospital. The incidents come after city and police officials have taken a number of steps to crack down on groups of young people disrupting businesses in the popular nightlife district.